DUBAI: Food exporters from non Muslim majority countries are taking advantage of the growth in the global halal food market, according to an industry expert. Mohammad Badri, managing director of International Halal Accreditation Forum (left), and Rafi-uddin Shikoh discuss challenges in the market for halal products. Rafi-uddin Shikoh, chief executive and managing director at research firm DinarStandard, said that the majority of meat exported to Muslim majority countries come from non OIC [Organisation of Islamic Cooperation] countries. “Today, the halal food space is a global value chain. 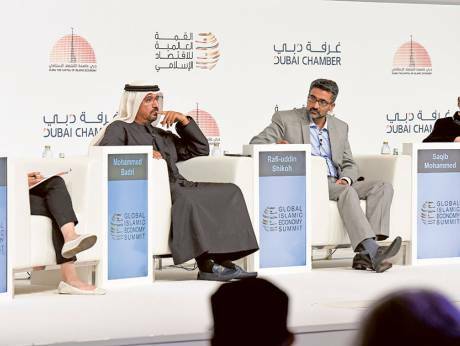 The biggest suppliers are from non OIC countries … Brazil is the biggest poultry exporter, India is the biggest beef exporter,” he said on the sidelines of the Global Islamic Economic Summit in Dubai on Tuesday. “In the 57 Muslim majority countries, 90 per cent of the meat comes from outside the Muslim countries,” he added. While Brazil, India and New Zealand are the top meat exporters to the OIC, a number of OIC countries are working on boosting their exports of halal meat, including Pakistan, Turkey and Iran. Non OIC markets like Thailand, South Korea, and China are also looking to increase their halal food production. Globally, Muslim consumers spent $1.17 trillion on food and beverage in 2015. By 2021, this figure is forecast to reach $1.9 trillion, a compound annual growth rate of 9 per cent from 2015, according to the latest Global Islamic Economy Report produced by Thomson Reuters in collaboration with DinarStandard. Muslim countries with the highest spend on food and beverage in 2015 were Indonesia ($155 billion), Turkey ($166 billion), Pakistan ($106 billion), Egypt ($78 billion), Bangladesh ($69 billion), Iran ($59 billion) and Saudi Arabia ($48 billion). The global halal ingredients market is worth around $245 billion, according to Thomson Reuters data. The OIC imports of halal ingredients reached $33 billion in 2015. Revenues for halal certified food and beverage products globally were estimated to be around $415 billion last year.